More info:From £760 - £785 excluding flights. Prices based on 2 adults sharing. Single supplement available. Mimimum age 14. 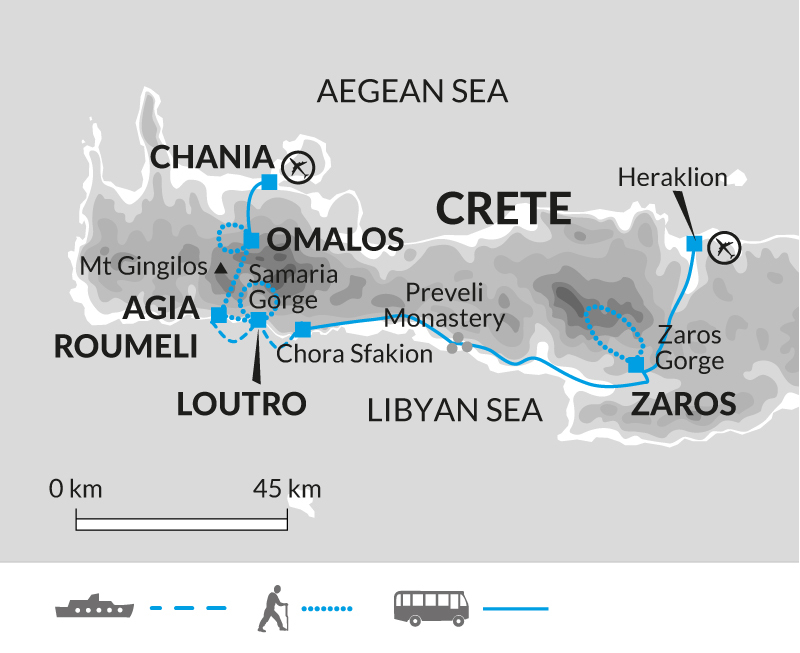 Throughout this tour to Crete we stay in locally owned accommodation in which you experience hospitatily and food, most of which is sourced locally, as well as some great wine! This not only provides direct employment within the hotel, but also has the effect of percolating money beyond to small businesses that supply the hotel and in this way money is spread throughout the region we visit. Our Tour Leaders are trained by us in the importance of responsible tourism with guidance given on how they can make a difference. Minimising our impact by exploring on foot means that this tour operates in a very eco-friendly way. Donations given on optional sightseeing visits to the monasteries around Zaros means that we are helping maintain these local churches. Taking the optional sea-kayaking at Loutro supports this community situated in a very much out-of-the-way location, the residents of which depend upon tourism. Our group stayed in hotels owned by local people in Crete. A Cretan guide would have been good, but we had a (very able, pleasant ) Ukeranian guide. however I'd recommend them if you can.